Why Do Most Podcasts Fail? Podcasting can be a hassle. Uploading your podcast to one service. Renting a player from another. Paying two separate bills each month. One to host your podcast files and another for your podcast website. Having to log into 3 or more accounts, just to publish a new show. No wonder most podcasts never make it past 7 episodes. Most podcasters are doing things the hard way. You need an easier way to get your podcast out there. You need one service that covers all your bases. You shouldn't need more than one account to broadcast your podcast. Pressing "Publish" once should upload your episode, update your website, and stream it straight into your listener's ears. BlastPod hosts your podcast files. We also provide you with a free, customizable website for your podcast. You get an exclusive podcast audio player for your website. You even get an RSS Feed creator to push your podcast onto iTunes, Stitcher, and any other podcast apps out there. 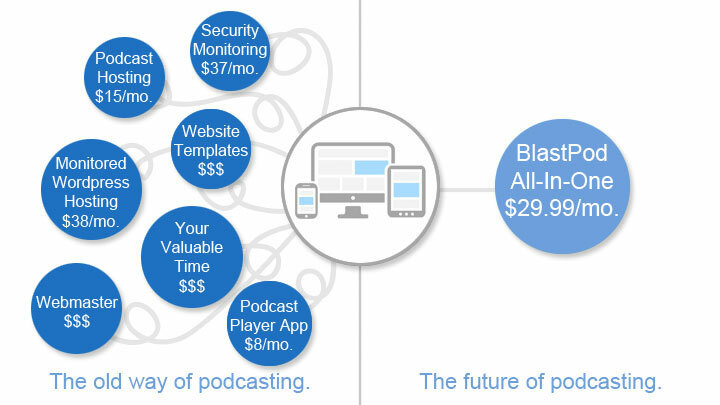 BlastPod gives you everything you need to reach the world with your podcast. You get it all under one account, for one low monthly price. BlastPod is a podcast hosting service, with a twist. Not only do you get hosting for your podcast files, you also get a customizable podcast website. Choose a template, pick your color scheme, and upload some episodes. Your podcast website will be up and ready to go within minutes. Getting your podcast out to the world has never bean easier. Manage your website, upload your podcast files, and interact with your listeners, all from one place. Just host it and post it, and you're good. Let us take care of all the technical stuff. 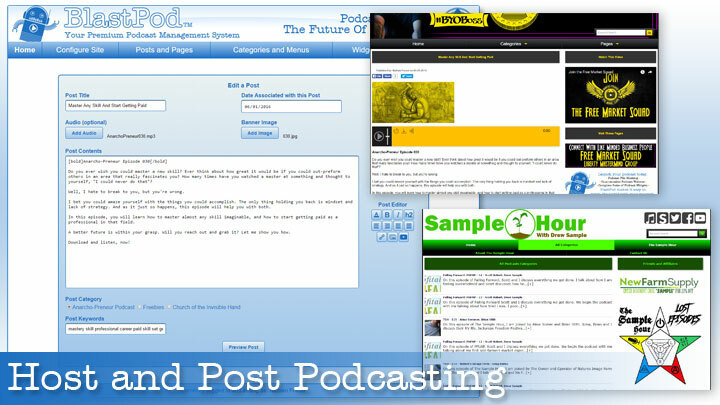 Upload your podcast episodes, create, edit and publish your posts, all on the same page. Stylize text, add links, embed images and youtube videos with your BlastPod Post Editor. Schedule episodes for automatic release in the future. Enable Discus comments for listener feedback. Integrate with social media for easy sharing and liking. Get listed on iTunes, Stitcher and Google Play with the BlastPod RSS Feed Generator. Use MailChimp sign-up forms to grow your mail list. You'll get all these features and more, so you can build a community around your podcast. Podcasting is competitive. BlastPod gives you the advantage you need. Podcasters have a variety of needs when it comes to upload limits. BastPod never re-encodes your files. This gives you full control of your audio quality. Whether you do a weekly podcast, a daily podcast, or run a network of podcasts, we've got you covered. Most podcasters mix their podcasts down in stereo, at 128k. This gives you a file size of about 1 MB per minute of audio. Meaning, 30-minute episodes will be around 30 MB in file size. Hour-long shows will come out to just under 60 MB. With the Silver Tier, you'll be able to publish 8 (eight) 30-minute episodes per month, or 4 (four) hour-long episodes per month. If you mix your podcast down in mono, you'll cut your file size in half, and be able to double your monthly uploads. Now that you know what to expect, which plan is the best for you? Claim your BlastPod Website, today. No need to spend days or weeks putting together your podcast website. With BlastPod, pick a template and a color scheme and you're ready to go. Get your podcast online in less than fifteen minutes. Get a website that looks great on any device. Make sure that you're on google's good side. All BlastPod websites are mobile optimized. Your listeners need to access your site, no matter how popular your podcast gets. You don't need restrictions on your bandwidth. You need a site that's always up and downloads that are always available. We make that happen. The ability to track what's working and what isn't is vital to growing your audience. That's why tracking downloads is so important. Track recent episodes and all time favorites with your BlastPod statistics manager. A podcast website without a podcast player is just a blog. But most of the player plug-ins out there cost an arm and a leg. Your BlastPod website comes with a built-in podcast player that rivals the best. It's stylish and features multiple playback speeds. Posting show notes needs to be easy and they need to look beautiful. The BlastPod post editor lets you change font sizes and colors, with the click of a button. Add Images, videos and hyperlinks. Create, edit and delete podcast posts with the ease of a status update. Sometimes you want to get ahead of schedule. You might want to batch record your podcast episodes and set them to release at a later date. BlastPod makes this easy. With post scheduling, just set it and forget it. You need an RSS feed to get your podcast on iTunes or Stitcher. You can hire a programmer to create one for you. You can use a third party, and hope they do a good job, delivering your podcast. Or you can use the free RSS feed generator that comes with every BlastPod account. Social media plays a huge part in the success of any content. If you want your listeners to share your podcast, you have to make it easy for them. Share and Like buttons let them spread the word about your show with the click of a button. A great podcast is like a conversation. The dialog needs to go both ways. That's why Disqus is such a huge hit with podcasters and their fans. Disqus comments make it easy to engage with your listeners and get feedback on your episodes. You want to join your listeners where they're already at. BlastPod websites make it easy to display twitter and facebook feeds, and youtube videos. Add quick links to your social media profiles in your website header, or on your podcast pages. Use your podcast to increase your social media following. Looking for affiliates to fund your podcast? We got you covered. Whenever someone uses your affiliate link to start their own BlastPod account, you get paid. It's a great way to have your podcast pay for itself, and earn some extra cash to boot. Flesh out your BlastPod website with a variety of different pages. About pages, landing pages, blog posts and more. You can even hide pages and make them viewable to people with a secret link. BlastPod puts you in full control. BlastPod connects with your MailCimp account, so you can use your podcast to grow your email list. Adding opt-in forms to any page of your BlastPod website is easy. Send a newsletter to your list when each new episode comes out at let them know about any offers you may be running. "Before I started using BlastPod, I was struggling to build a relationship with my audience. I did not have a reliable podcast host or a professional looking website. However, now that I’m signed up with BlastPod, I can confidently send future listeners and guests to my website. I’m loving the new Disqus widget. Listeners can comment and share their thoughts about each episode, enabling me to have direct communication with my audience." "Podcasting became an itch I needed to scratch. I knew I would regret it if I didn't at least give it a shot. I struggled to get started for over a year, but just kept hitting brick walls. I just didn't have all the tools, time investment or money to pull it all together. Then I heard Nathan talking about Blastpod, his entrepreneurial project. I jumped at the chance to do business with a real person, rather than some huge, faceless company with little accountability. My website and feed were published in under a week and I was off and running! Nathan and his team are always working on new features to help my podcast grow. I've received top notch-advice, guidance and help with a personal touch. I've been putting podcasts out for half a year now with ease. It's my pleasure to highly recommend this service." Whether you do a weekly podcast, a daily podcast, or run a podcast network, we've got you covered. Stop trying to build you podcast website on a platform made for bloggers. Can I use BlastPod to build my website, even if I don't know how to code or use WordPress? Yes. BlastPod is made for podcasters who have zero coding experience. You can have a website up and ready in five minutes, without the confusion of having to install and learn WordPress. Do I have to pay extra for the additional hosting of my BlastPod website? No, your website comes free with your podcast hosting. No need for additional hosting services. Can I use a domain name for my website? Yes. You will get a free sub domain (e.g. mypodcast.blastpod.com). But, if you own a domain name, you can also integrate that with you BlastPod website (e.g. mypodcast.com). Can I host more than one podcast on a single account? Yes. You can host multiple podcasts on one account. You could host a whole network of shows, if you wanted. You could even give each podcast its own rss feed, and have an overall feed for the entire network. Can I use BlastPod to host a video podcast? At this time, we only offer audio podcast hosting. Can I integrate a BlastPod site into my current website? No. 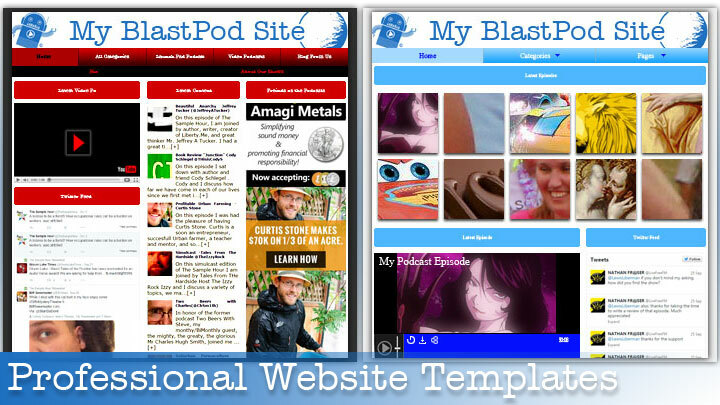 BlastPod is a stand alone system designed for creating a new podcasting website. Is this a WordPress platform? No. It is not a merely blogging platform that has been converted to work for a podcast. 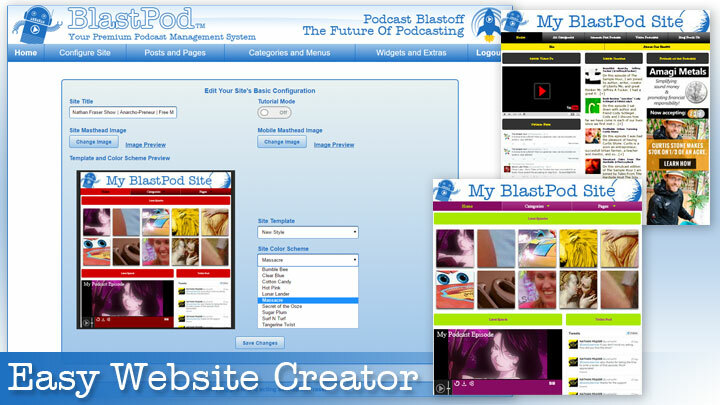 BlastPod is a website manager made exclusively for podcasters. Can I use WordPress plug-ins on my BlastPod website? For security reasons, we do not use WordPress plug-ins. We do have integration with a growing number of 3rd party api's. Including facebook, twitter, Disqus and YouTube. We are also working on better integration with email capture tools like Lead Pages and Mailchimp. Yes. You can always upgrade or downgrade your tier, to suit your upload needs. You can also cancel your subscription at any time, with no cancelation fee. Nothing else offers you the tools, value, and ease-of-use that you get with a BlastPod website. You can host your podcast the old way, if you want to. You can pay thousands of dollars to build your podcast website. Then pay a small fortune each month, just to maintain it. But you don't have to. We built BlastPod for you. Now you can compete with the major players. Now your podcast can get the attention it deserves, without emptying your wallet. BlastPod is the easiest way to host your podcast files and manage your podcast website, all in one place. We back this up with a 30 Day Money Back Guarantee. If you are not 100% satisfied within the first 30 days of opening your BlastPod account, we will refund your entire purchase. No questions asked. All refund requests made within the first 30 days of the account will be respected.